The preceding industrial revolutions instigated progression: Mechanisation. Production. Technology. Each revolution lasted for almost 100 years and each one gravitated towards greatness and towards greed. At the root of each revolution was technology and people. Welcome to the Fourth Industrial Revolution. The Fourth Revolution is about exponential expansion and merging technologies in the physical, digital and organic spheres. It is about technology and people. Big Data, Fast Data, Digital Transformation, IoT, AI, UX, CX. Words and phrases that intimidate, undermine, impress, depress. Exploding at what seems to be a pace and size that is too big for any of us to comprehend, acknowledge or implement. While technology plays an important role in digital transformation and making sense of this rapid evolution is imperative, the people factor is the ignition of it all. Business leaders need to drive innovation and build an intelligence interface between what is real and what is artificial. Their objective needs to change so as to be the catalyst that ignites innovation within your company – and the end target of changing the lives of millions. Driving innovation means understanding and leveraging human intelligence and behaviour into something smart. Human capital forms the base of any workforce, success, competition, and customer-base. But, how do we change attitudes, get buy-in and maximise the potential of each person? It is a change in culture that triggers the shift. It is about culture innovation! 100 years. We have time. We need to slow it down. The Fourth Revolution is simple. It is about the small: Nurturing small clusters of continuous innovation with the customer at the core of every corporate objective. These clusters have the potential to catalyse innovation and change the face of a nation. Constant uncomplicated change nurtures growth. Small. Simple. Smart. 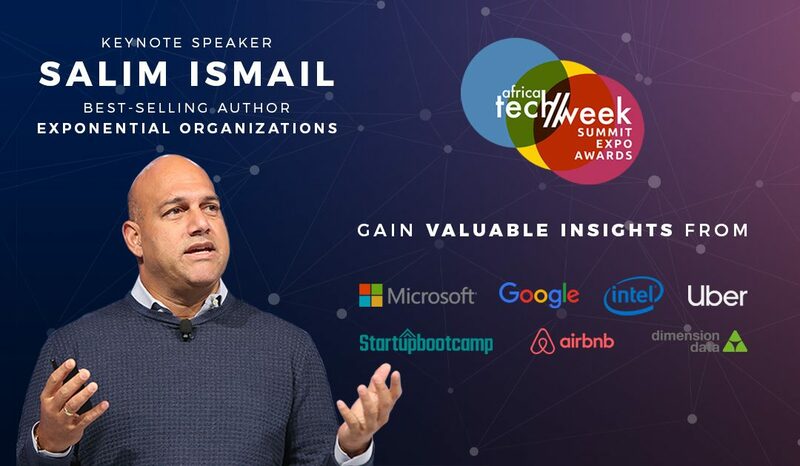 World-leading tech strategist, Salim Ismail, former Yahoo! Vice President, Founding Director at Singularity University and author of the best-selling Exponential Organisations believes that if you are not disrupting your business or industry, someone else is. How do you change your game? How do you become a disruptive entity? Be part of Africa Tech Week, the international innovation expo summit, from 4 – 6 March in Cape Town, South Africa and we will pull out all stops to make you understand what it is all about. Our Keynote Speaker, Salim Ismail, shares his jaw-dropping insight on how companies can leverage technology and strategy to grow 10 times faster than their peers. He will speak to you about how he has moulded cutting-edge ideas into thriving startups and applied forward thinking to invigorate industries. Salim built Singularity University, with the objective to “educate, inspire and empower a new generation of leaders to apply exponential technologies to address humanity’s grand challenges”. The University has empowered people from more than 85 countries to apply disruptive technologies to more than 100 startups as well as countless patents and ideas. Africa Tech Week is about harnessing the nation’s innovation, talent and people, so that it culminates into success that impacts society as a whole. Africa Tech Week is about exponential expansion, its objective is to teach industry how to build a culture of value and grow a disruptive attitude that stands tall in the 21st Century. The fourth revolution no longer works according to this 20th Century premise. The world has changed. Progress depends on change, everywhere, all the time. With the acceleration of technology driving change and uncertainty in every market sector, it has become essential to adapt to these new conditions. Africa’s agility to respond to this ever-changing terrain is to ensure that growth is inclusive and benefits all: a fundamental strategy to develop democracy and social cohesion. Progress has historically been dependent on big conglomerates and global brands. This no longer holds true. The Goliaths, while sitting on their laurels of monopolistic success, have become immune to change. They attack innovation through their bureaucracy of old bravado. Startups and innovators pivot continuously – their sling, the disruptor of marketplaces. Big companies need to change direction, before change kills them. Africa Tech Week invites all professionals to meet at the crossroads of the digital era where some of the world’s most influential tech authorities converge to engage and network. Case studies from global players, presentations and panel discussions will diversify and wow your knowledge set. Be part of an exchange that will see industry leaders divulge global perspectives on the impact of breakthrough technologies. Africa Tech Week is a roadmap for every startup, SME, company, organisation, national and regional entity in Africa– no matter what stage of their innovation path they are at. World-class speakers, success icons, trailblazers and trendsetters navigate thought-leaders, change-makers, creators and resistors with a dialogue exchange of debate, opinion, experience and knowledge; demonstrating how technology can transformed in a sustainable way that leads to success. Success that is built on an evolved culture of value, disruptive thinking and no-wastage productivity – three years ahead of your industry peers. We show you how to get to the top and how to stay there. TopCo Media in partnership with the Department of Science and Technology and the City of Cape Town welcome you to the region’s new largest tech event that is not only about tech.